Opportunities PEI is here to help connect people who want to live in PEI with the resources to help build a career and a life in PEI. Opportunities PEI is managed by the Office of Recruitment and Settlement a division of Workforce and Advanced Learning. Skilled immigrants possess talents and accreditation in a variety of professional fields. They are primarily between 25-44 years of age and 69% have a university degree or higher. Newcomers have international experience and are often multilingual. They can help Island businesses create innovative solutions to business challenges. Is it time to reflect PEI’s changing clientele and communities in your workforce? If you would like to find out more about how experienced, qualified newcomers can help your business grow, call 902-628-6009 or email [email protected]. Geoff Boyle, owner of The Grove Orchard and U-Pick, and Wisam Abou Assali, new employee from Syria, are bracing new apple trees. From the moment Geoff Boyle and Wisam Abou Assali started talking, it was clear they had a connection that transcended their different backgrounds. The Grove Orchard and U-Pick is an apple and berry farm in Warren Grove, PEI. It is owned and operated by Geoff. His son Matt is an investor who works there when he can. In March 2016, Geoff was looking for an employee through the Employ PEI program. Wisam Abou Assali, his wife Dima Mreesh and their two sons arrived on PEI in January 2016 as refugees from Syria. They were sponsored by Saints Peter & Paul Orthodox Church in Charlottetown. Wisam and Geoff were introduced by Amy MacLean and Lisa Chaisson, who are members of the Employment Assistance Services team at the PEI Association for Newcomers to Canada. 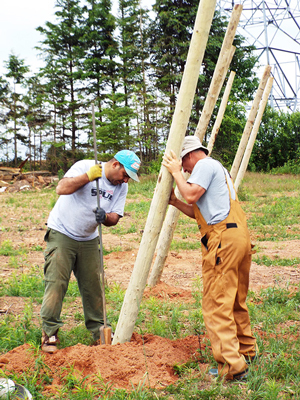 Within days, Geoff invited Wisam (pronounced WisAHM) to join him in Nova Scotia on a training course on grafting and orchard skills. In April, Wisam began working at the Grove Orchard. Together the two men spent April and May preparing 5,000 apple tree grafts for planting, and then working in the fields on a diverse number of crops. Geoff is new to farming and Wisam is new to Canada, and so the two men are learning as they go. The farm cultivates a variety of berries such as strawberry, raspberry, high bush blueberry, and elderberry. The orchard has at least nine varieties of apples, two varieties of Asian pears, five varieties of plums, seedless grapes, plumcots (plum-apricots), and chums (cherry-plums). “Before the war in Syria, I worked in real estate and had another business,” says Wisam. “I also owned two farms. Both had olives, figs, and grapes. The one near the mountains had olive trees with big olives good for eating. At the other farm we used the olives for oil. Between the trees we planted beans, tomatoes, and cucumbers. The beans were very good, very delicious,” Wisam raises his hand to his lips in the universal gesture meaning tasty. “In Syria we had a very beautiful home. Now, everything is gone. I have left behind everything, including my parents and my brothers. “I stay on PEI because of my wife, her family, and my children, Ibrahim and Andreh, and now, because of Geoff. Geoff… he is so good.” He hesitates, his eyes gone liquid with these simple but powerful words, and what this Canadian man means to him. Geoff jumps in and fills the silence. He talks about the respect his family has for Wisam’s family and the courage it took for them to leave everything behind in Syria to come here. Geoff goes on to say how important family is to both men. “That makes us the same,” he says with emphasis. For more information about the PEI Association for Newcomers to Canada, visit www.peianc.com. Li Yuan Ma, Associate Commercial Account Manager and Jason Ahern, Branch Manager. RBC is Canada’s largest bank. On PEI, RBC employs over 50 staff who work out of four branches and an RBC Dominion Securities office. “One of the many advantages of working for RBC is the incredible range and number of career opportunities,” says Jason Ahern, Branch Manager. Jason started his career at RBC as a client advisor, and has worked in nine roles in 18 years. “Employees often start at a customer service level, which introduces them to our many products and services and allows them to work with clients face-to-face. “For our client advisor role, we look for people with strong interpersonal skills and an interest in helping clients; we will train the banking part. “A diversified work force is likely to identify with the unique needs of clients, and are therefore able to serve them better,” adds Jason. “A great example of this is Li Yuan Ma. After graduating from the business program at McGill/Concordia University in Montreal, she started with RBC as a Customer Service Representative (now called Client Advisor), moved to Account Manager, and two years later became an Associate Commercial Account Manager. “She excels at providing superior advice to our clients, and has been awarded some of the highest recognition the bank has to offer. She is also very respected in the Chinese community. Her fantastic reputation has helped position RBC as the bank of choice for many newcomers to PEI. For RBC job postings, resumé and interview tips, visit www.rbc.com/careers. Together with her parents, Anja Salijević (Ališić) immigrated to PEI as a refugee. After high school, she completed her education in the United States, obtaining a Bachelor of Science degree in Health Promotion and Education. She worked in the States within the non-profit world for several years, mostly in fundraising, until 2014 when she and her husband decided to move back to the island where Anja had grown up. Anja’s credentials did not allow her to work in her field in Canada due to the occupation regulations. Dandan helped Anja assess her skills and develop a job search plan. 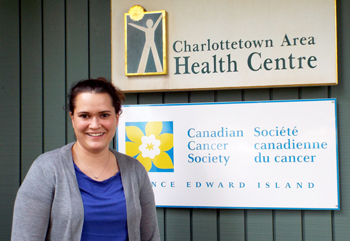 Part of that plan included volunteering—a choice which led Anja to help out at several health fairs, illustrating her knowledge and excellent people skills to staff at the Canadian Cancer Society. Yemi Olusoji, her husband and three children (now 15, 14, and 7), arrived on PEI in March, 2013. She met with Employment Counsellor Lisa Chaisson at PEI ANC Yemi is an accountant and quickly began working towards her CPA certification for Canada. Yemi received her Canadian certification in September 2013, and started looking for work in her field. Lisa helped Yemi update and rework her resume for the Canadian market; she scanned job sites and mined her contacts for a suitable position for her. Yemi provided Lisa with updates on her progress. She conducted her own research and compiled an extensive list of accounting firms, and sent them all her resume. Lisa reviewed her cover letters, and Yemi attended a two-day Employment Workshop at PEI ANC to learn more about Canadian work culture. Yemi discovered that many companies on PEI use the program, Simply Accounting, so she signed up for a 16-week evening course at Holland College to improve her use of this program. She also applied for a “Letter in Good Standing” from the International Accounting Body, ACCA, and she took a law and tax course online. In this way Yemi proved to be an ideal employment client: proactive, diligent, and self-directed. Still, despite both Yemi and Lisa’s best efforts, no volunteer placements or jobs were forthcoming. Yemi was understandably getting discouraged. Finally she was asked to interview for a position of bookkeeper for a local company. To assist her, Lisa arranged for a mock interview with PEI ANC’s own accounting person, Barry Ansems, as one of the interviewers. Lisa and Barry interviewed Yemi and recorded the interview. They worked with her to improve her answers where necessary, and indicated where her strengths were evident. 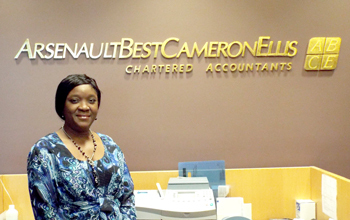 While Yemi was unsuccessful at being hired for that position, she had met Barry Ansems who was impressed with her, and he gave Lisa a contact to approach at Arsenault Best Cameron Ellis (ABCE) accounting firm. One of the greatest challenges for newcomers is to find that first job to can gain Canadian work experience. The Enhanced Employability Essential Language Skills (EEELS) class that is offered at Holland College through its LINC program, for newcomers with Level 6 and above English skills, is instrumental in helping its students gain their first work placements in various companies and businesses. PEI ANC referred both Shan Ying Wang, who arrived on PEI in December, 2013, and Torsten Kutterer, who arrived in April, 2014, to the LINC program. It was there they became friends and gained their first Canadian work experiences. A PNP client, Shan Ying’s obligations under the program were to open, buy or invest in a business. He discussed these options with his ANC Employment Counsellor, Etta Esler. As the owner of a factory in Ningbo, China, Shan Ying was advised by Etta to gain some Canadian work experience, before opening his own company. In July 2014 he opened Reito Industrial Products, Ltd. Reito creates precision castings from metal as well as plastics, mainly for furniture and the auto and construction industries. 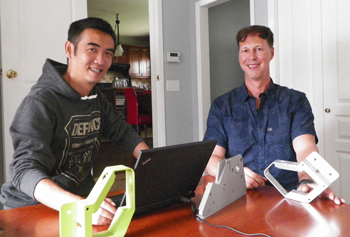 In the fall of 2014, Shan Ying and Torsten met again in the Newcomer Entrepreneur program (NEP) offered by the PEI ANC in partnership with the PEI Connectors program. They studied the components of a business plan and received fi rst-hand information from local experts on business topics. They made vital connections with other newcomers and established Islanders. Before moving to Canada, Kutterer had worked as sales and marketing manager of a family-run wine business in Germany. Shan Ying decided to hire Torsten to market his company. Torsten agrees. “Building a network is vital. Joining Holland College and taking a class like the EEELS class lets you meet people at once.” When Torsten and his wife, Anja, came to PEI, they signed up for Employment Services, volunteered for different community events, took Mandarin classes, and attended local concerts and PEI ANC events. 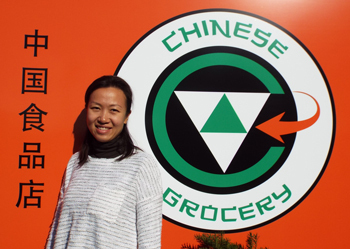 “As a newcomer, when I first arrived, I did not know what to do,” says Nan. 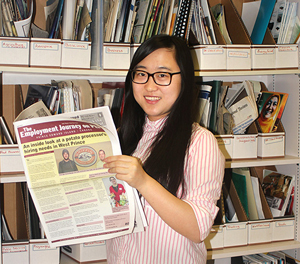 “Dandan Wang, my Employment Counsellor at Newcomers Association helped to reorganize my resume, and showed me useful websites such as the Job Bank. We investigated companies on PEI that were in my industry, like Sun Life Financial. My English is good, so I took interpreter training and I do that for the PEI ANC. I also participated in the Employment Workshop offered by ANC on Canadian workplace culture. I studied for two months for an exam to upgrade my insurance credentials to Canadian ones. Now I am an insurance agent in a pre-contract program with Sun Life. Living on PEI exceeds my expectations. It is not a big place, but I like that. I love the clean air and the friendly people. The weather is so nice, even though the snow was so deep last year! I went to DiverseCity Festival and was so impressed and surprised with how big it was, and how much fun. My parents were visiting and they were amazed that this festival was on a tiny Island. We went to the Summerside festival also. My name is Jing Zhao. Currently, I volunteer for The Employment Journey on PEI. This newspaper provides job information across PEI, and I have heard about it from many friends. I have wished to be a member of this newspaper team since then. Now, as a volunteer, I will interview new PEI businesses owned and operated by newcomers from China, and report their job opportunities to benefit local job seekers. My goal is to build the personal inter-relationship between Chinese businesses and the local workforce. I am an international student from China, and my major is English. I took my first two years of study at Southwest Jiaotong University in China, and then transferred to the University of Prince Edward Island in 2014. During my two years of study, I have enjoyed my academic experience at UPEI. I have gained many valuable skills, such as time-management, critical thinking, professional writing, and public speaking. I worked hard, and all my professors at UPEI are so great, and they have given me a lot of help. I was on the Dean’s honour list and won The MacLauchlan Prize for Effective Writing in 2015. Apart from academic study, I have worked some part-time jobs. I work as an on-campus editor in The Cadre, the UPEI student newspaper. I aim to spread Chinese culture and report news to other students. I am also an editor for the Canada & China International Business Newspaper. I translate between Chinese and English to allow Chinese immigrants to more easily understand the information. As for volunteer experience, I am a member of Chinese Knot, the UPEI Chinese Association, and I volunteer at PEI Chinese School, teaching children Mandarin, and conveying Chinese culture. Also, I am an English as a Second Language tutor for the PEI Newcomers Association. I help other newcomers improve their English and get involved in their new country. Click for related articles for Newcomers to PEI.